Derrick Gravener & Sarah-Louise CarterDerrick (B.F.A. '18) and Sarah (B.A. '18) are UBC alumni. We’re He said/She said. 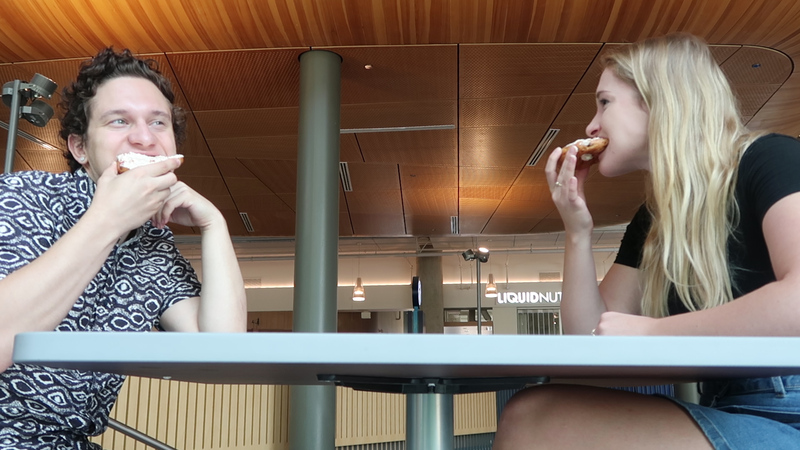 Two foodies on a mission to test the variety of snack offerings around campus and give candid opinions on the scrumptious snacks we find. These posts will be bite-sized, but packed with flavour—like a good cocktail weenie. 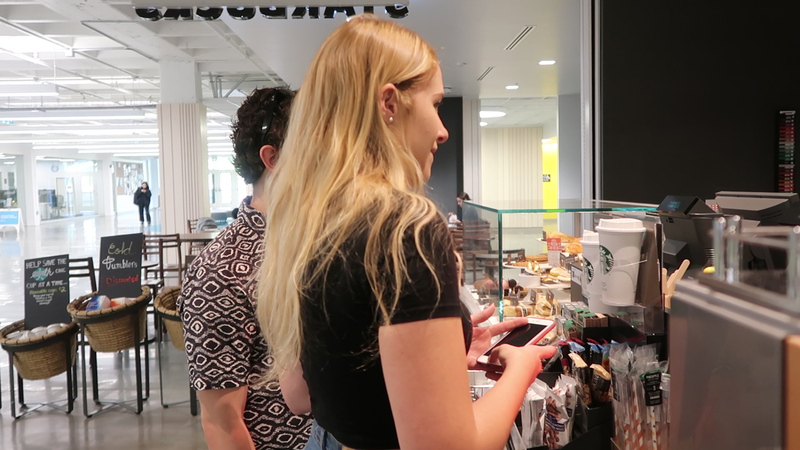 Today, we’re rating the bagels around campus and asking the age-old question: as a seagull, would you swoop for this bagel? Time: The same time we waited for Queen by Nicki Minaj to drop. He said: You can rip it or you can bite it. She said: Good layer of cream cheese on this! He said: Okay, there’s a lot happening right now. It’s kind of like an intro class. She said: The syllabus has been thrown at me. She said: The herb cream cheese really comes through. With the sesame seeds, it’s a unique pairing. He said: I’m liking the garlic. There’s a lot of garlic in this. You will not be going on a Tinder date after this, unless the Tinder date is a vampire and you hate them. 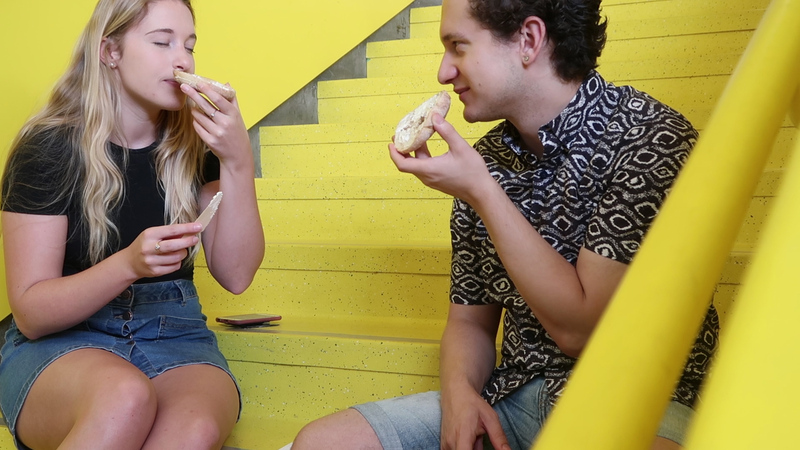 This is a revenge Tinder-date bagel. 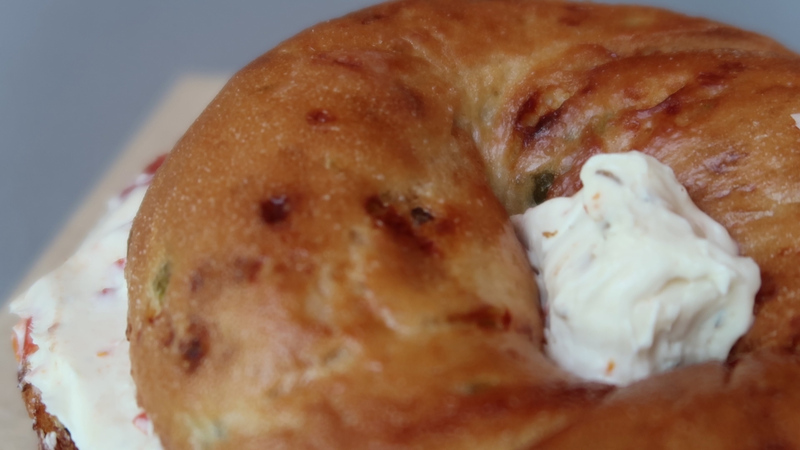 Also, there’s the perfect amount of cream cheese on this bagel. 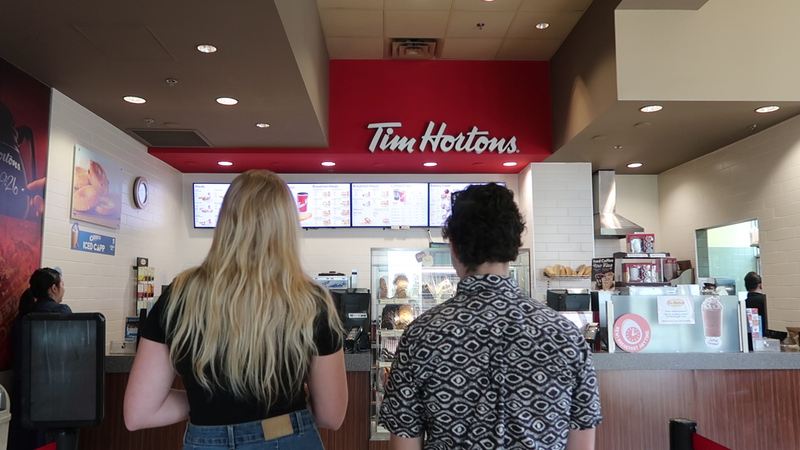 She said: Yeah, I was going to say—they really have got the ratio down. He said: Whoever did this...god’s work. She said: Would you swoop this bagel? He said: Yeah, I love garlic. She said: I feel like it may not be the first bagel I swoop, but I would still swoop it. Time: Could read about 20 tweets. She said: Well, off the bat, already disappointed that we have to cream cheese the bagel ourselves. He said: Did you just use cream cheese as a verb? She said: I did. 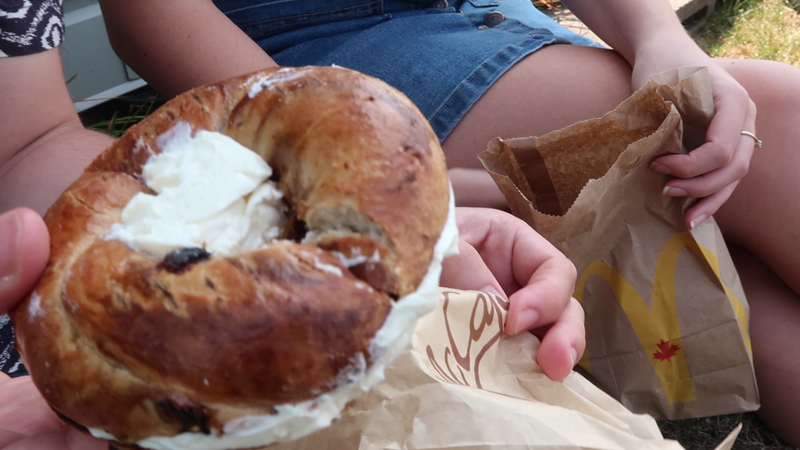 To cream cheese a bagel. ‘Cause if you’re in a rush to class, you don’t want to have to be putting cream cheese on a bagel in lecture. He said: That being said, it’s very choose-your-own-adventure. You get to pick the amount of cream cheese that you want. He said: The smell is like a baguette. Like, if you told me I was eating a baguette right now, I would be happy. He said: Marseille, is that you? This is my boyfriend, Bagél. 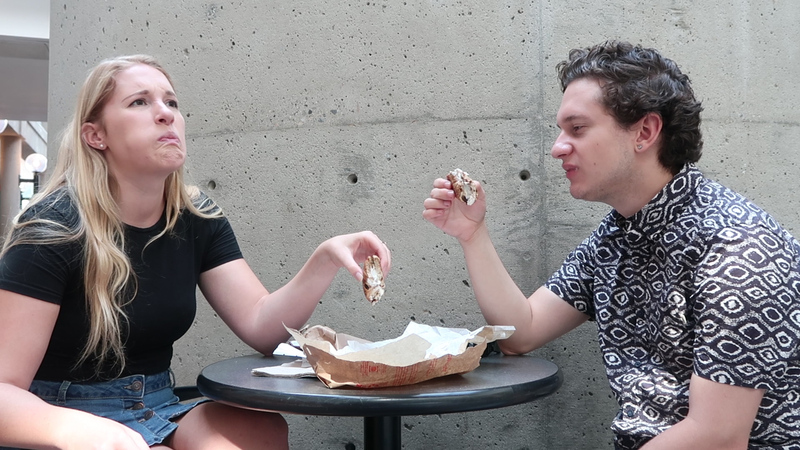 She said: If you were a seagull, would you swoop this bagel? She said: Yeah, I think I would, too. Time: A Nicki Minaj music video. She said: You know I have high expectations for this bagel. He said: If this cream cheese doesn’t pay my tuition, I don’t know if we can be here. She said: Oh wow, look at that! That’s the amount of cream cheese that you want. She said: Wow, wow, I don’t think I knew flavour until this moment! He said: I’m leaving my baguette boyfriend Bagél for this. He said: Every time, every day. She said: I would be a seagull that stalks the nest, just waiting for anyone to leave so that I could swoop this bagel. He said: Oh, I would go inside the nest. I would cause a ruckus for this bagel. I would wait a long time for this. Time: Waiting for the 99 B-line in rush hour (she’s every 3 minutes y’all). She said: There’s a lot of cream cheese. He said: It’s kind of like a cream puff amount of cream cheese. She said: I don’t have high expectations for this. He said: The queen doesn’t like raisins. She said: That’s the thing. Well, I’m avoiding the raisins in it. I’m just trying to go for the cinnamon. I just got a raisin and I hate it. I can’t handle the raisins. He said: If you told me this was a McDonald’s bagel, I would be like “nuh-uhh”. So I lowered my standards for the fact that it’s a McDonald’s bagel. For something from McDonald’s, it’s really good. He said: I mean, I’m here for it in that it’s cinnamon raisin. It’s our first cinnamon raisin all day. 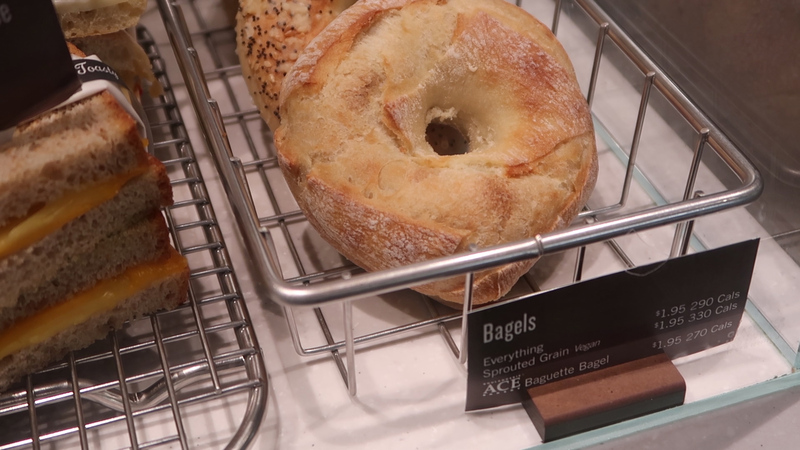 I really enjoy that aspect of it—it’s a sweeter bagel. The price is right. The location—it’s perfect if you live in Fairview, or if you’re close to the 99 stop. Yeah, I would swoop for it. She said: I think I’d hesitate before I swooped it. 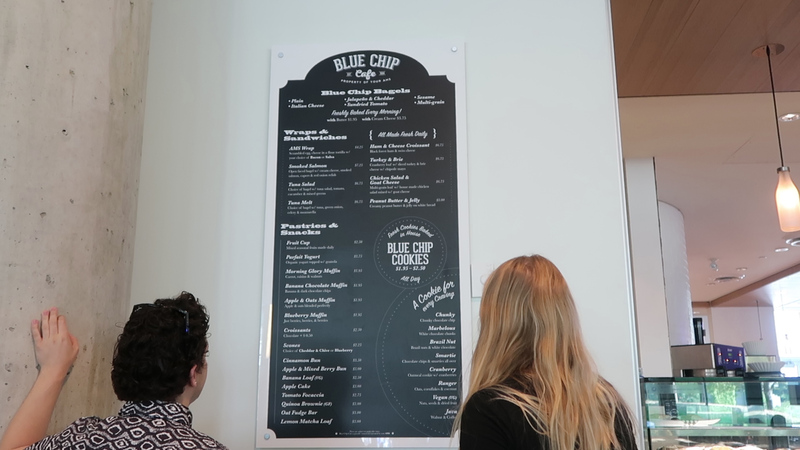 No matter your bagel-to-cream-cheese preferences, UBC’s sure to have something for you! 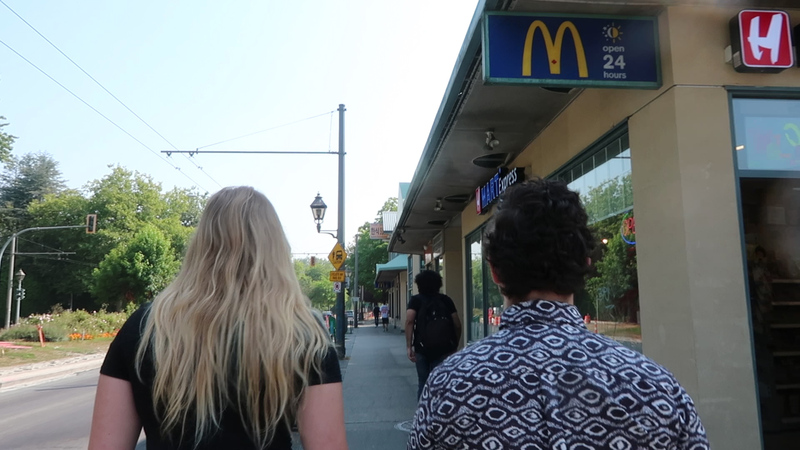 Be sure to check back here on the UBC Life Blog to hear what He said/She said feels about their next snack quest: pizza!